The mention of Marley's funeral brings me back to the point I started from. There is no doubt that Marley was dead. This must be distinctly understood, or nothing wonderful can come of the story I am going to relate. If we were not perfectly convinced that Hamlet's Father died before the play began, there would be nothing more remarkable in his taking a stroll at night, in an easterly wind, upon his own ramparts, than there would be in any other middle-aged gentleman rashly turning out after dark in a breezy spot—say Saint Paul's Churchyard for instance—literally to astonish his son's weak mind. 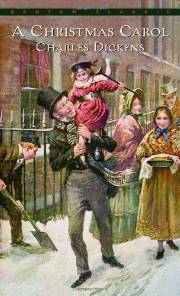 A Christmas Carol; by Dickens, Charles; DK Publishing, Inc.
A Christmas Carol; by Charles Dickens; audiogo, AudioGO Ltd.
A Christmas Carol; by Dickens, Charles; Chamberlain Bros., Chamberlain Bros.
Oliver Twist; by Charles Dickens; book sales, inc., Book Sales, Inc.
Oliver Twist; by Dickens, Charles; DK Publishing, Inc.